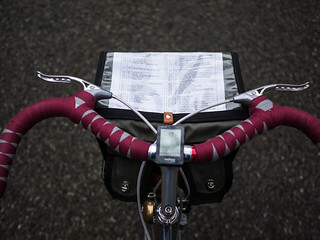 For me, the brevet season is getting started here in the Pacific Northwest. My first long ride was the Chilly Hilly. 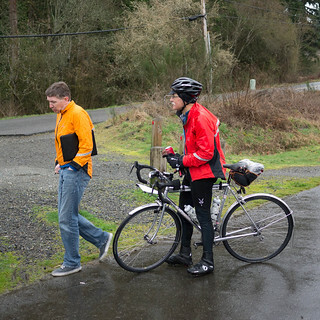 This is a course that circumnavigates one of the islands near Seattle in the Puget Sound. 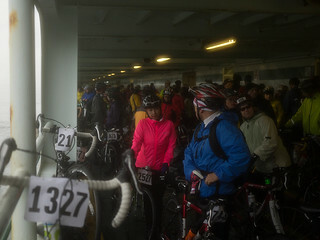 It includes a nice ferry ride with hundreds of bikers taking up the car deck. The official distance is 33 miles, but I ride to the start, so my distance is more like 55 miles. This year was an overcast day starting in the 40s, and ending in the 30s Farenheit. 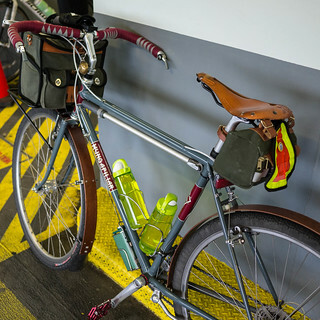 It started raining hard after the ride, just as I was departing the ferry in Seattle. This made the ride home a bit miserable, but I felt pretty good, however, and it was a great start to the season. I rode the Hunqapillar to try out flat pedals. No knee problems encountered, and I didn’t really notice the extra weight of the bike except for the amazingly steep hills on a few sections of this infamous ride. I also went without any hand pain using the Albastache bars. It was a nice and comfy ride! Next up was the Spring Populaire put on by SIR. 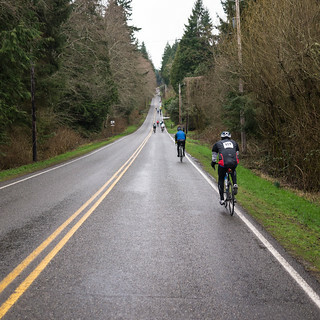 This is a 100k ride (around 62 miles) and starts nearby in the Greenlake neighborhood. I rode to this one, as well, so added a few miles to the ride. It was my first long ride on the new Velo Routier, and I was excited to get some miles on it to get a feel for 650B, low-trail, rando geometry. The bike was ready to go with lights (though I wouldn’t need them) and all the normal gear. I did forget a pen, however – kind of a faux pas for a seasoned rando like myself (sic). I saw a few friends at the start, but after we took off, I was on my own for the whole ride. The bike handled great, and I was towards the front of the 100 or so riders that showed up for the ride. I quickly made my way through the controls, and was having a great time. The tires floated, and the scenery rolled by. I was feeling good, and eating/drinking enough to feel strong. 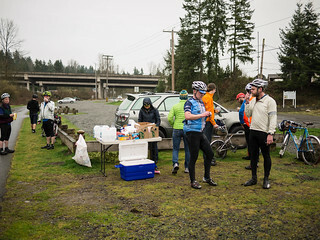 The rain started to become oppressive, and I was soaked through by the midway point, so at a bathroom stop in Renton, I took off my outer wool jersey and put on my rain jacket. I had to wring out my gloves, so I put on my extra pair. Not much could be done with the shoes, however. They were a brand new pair I had gotten for the ride. I wanted a light pair of hikers with a stiffer sole, and they fit the bill, but by the time the ride was done, my feet were soaked and numb from the cold. Hmmm – time to rethink this? Someone was definitely glad to see me at the end! Toussaint Build, a set on Flickr. This is how I purchased the bike – frame, fork plus! I need a different front rim, and I’m re-curving the fender line, but it will likely get built up this week. I can’t wait to ride the sweet Hetres. I have been awaiting the Soma Grand Randonneur frame I had ordered a month ago, and suddenly got a wild hair to re-think the decision. Actually, I lost patience as the rando season is swiftly approaching. Late last year, my LBS built up a few newer arrivals in the steel bike, low-trail, 650B vein. I did some test rides, and came away with a definite feel for how these bikes differ from my existing rides. In my weekly after-work stop, I was chatting with owner Kathleen, and discussing ordering a Rawland Stag (one of the bikes in this club I hadn’t ridden) when she suggested I look at the Toussaint again. I quickly dismissed it as I recalled it being a 57cm frame, and feeling that was too small. But the seed was planted. 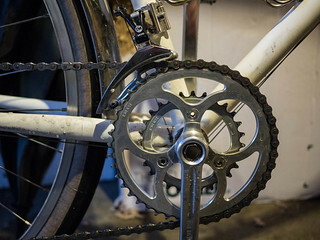 I looked up the geometry again, and noticed it was not much different from my A. Homer Hilsen – 1cm less top tube, but the same stand over. Hmmm – that’s why it felt so right when I rode it after the Soma. 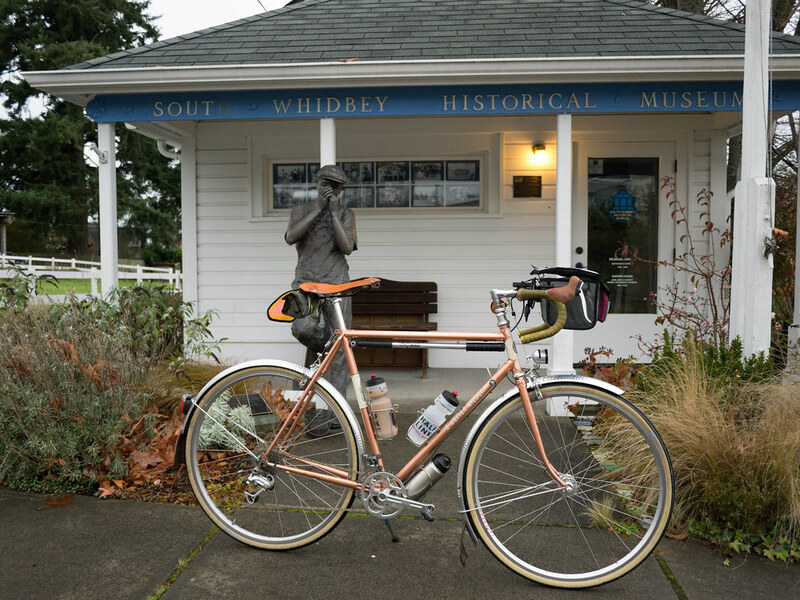 Having the good fortune to live and ride in Seattle near good local bike shops has its blessings. I stopped in FreeRange Cycles on Tuesday and tried out a couple of new rides that sport a low trail geometry with a bent towards the randonneuring crowd (me). Both are a bit of a departure for me in that they are TIG welded steel frames. 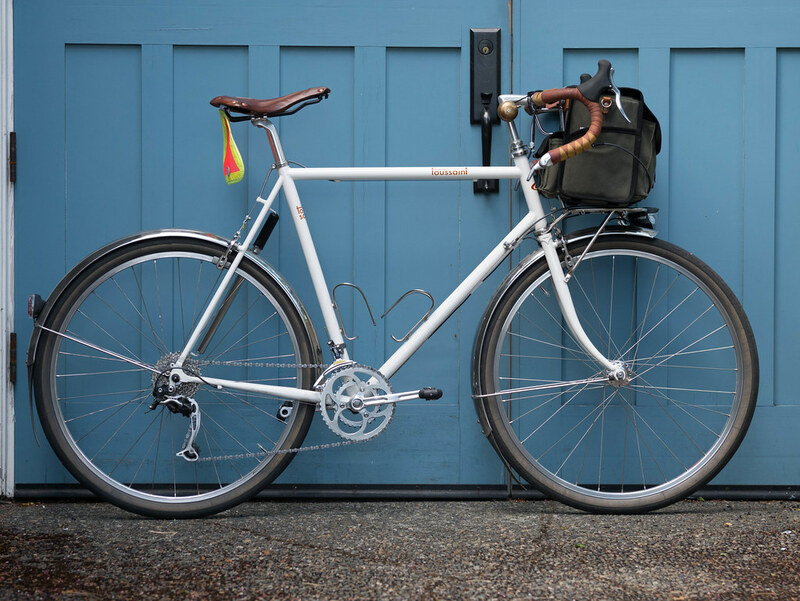 The Soma Grand Randonneur was recently shipped, and is a very compelling deal. It is a $500 frame/fork combo that was designed by Mike Kone of Boulder Bicycle and Rene Herse fame. Note: Soma is doing some great combo design deals lately. First Grant Petersen‘s design on the San Marcos, and now a low-trail guru’s take on a commodity frame. You’d be hard pressed to not want both! 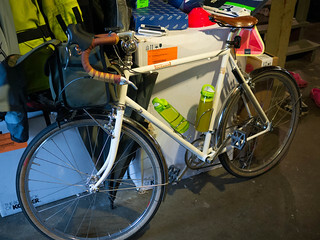 The bike I rode is a 55cm (small for me) with a large porteur rack on the front. Good to add some weight and see how it feels with a bit of front load. In my short ride, I felt immediately at home on the bike, and really felt some of the benefits of the different front-end geometry. 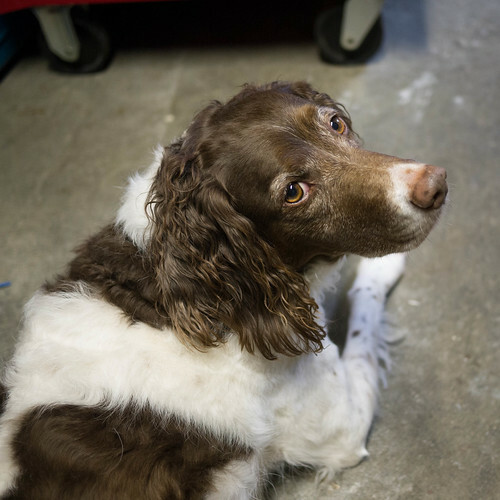 It was quick handling, but forgiving – not twitchy. As I slowed to a stop, I noticed there was none of the flopping I have on my higher trail bikes if I let go of the handlebars. OK – that’s kind of nice. But the thing I liked more is that on a slow climb, I didn’t have the bars slightly twisting back and forth with my pedal strokes. It tracked well at low speeds. Hmmm – I may like this sort of thing. On turns, at medium and higher speeds, there was no uncertainty of where I was going. Perhaps it didn’t feel like it was “on rails” like my Rivendells, but there was no bad effects I could ascertain. As for riding no-handed, it was about like my Miyata. Not great, but doable, and I wonder if it’s not due to the high saddle, low bars on this slightly too small frame for me. 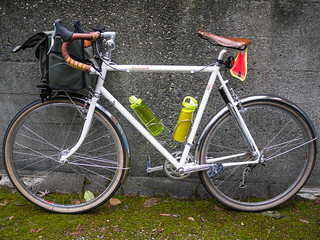 On to the other bike – a new effort out of Canada. Cycles Toussaint is a Calgary company recently formed (2012) with two bike models. 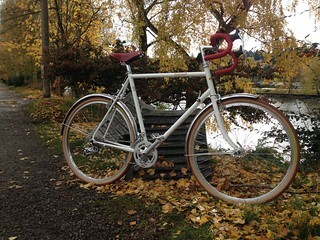 The version I rode was a demo Velo Routier sent to Kathleen at FreeRange to see if there is interest in the area. 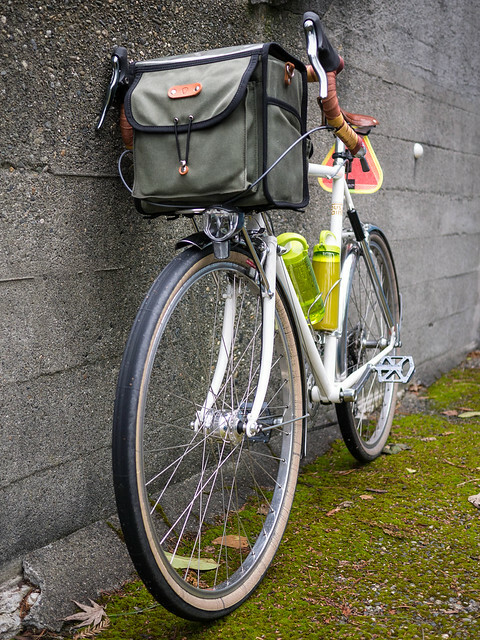 It’s a smart-looking white frame that was nicely built up in a traditional rando effort. It was slightly bigger at 57cm, so more in line with my size (I would probably go with a 59-60cm frame).